The executive director of the Seattle Community Police Commission says “changing a system is like moving a mountain.” A lawyer who once planned to devote her career to farmworkers, Fé Lopez works with people on all sides of the city’s police-reform effort. Fé Lopez knows how to turn strangers into friends. The daughter of migrant farmworkers got practice as a child, attending 13 schools before leaving sixth grade. But she also knows how oppressive discrimination and poverty can be. Lopez learned that while growing up on the move and in rural Grandview, Yakima County. 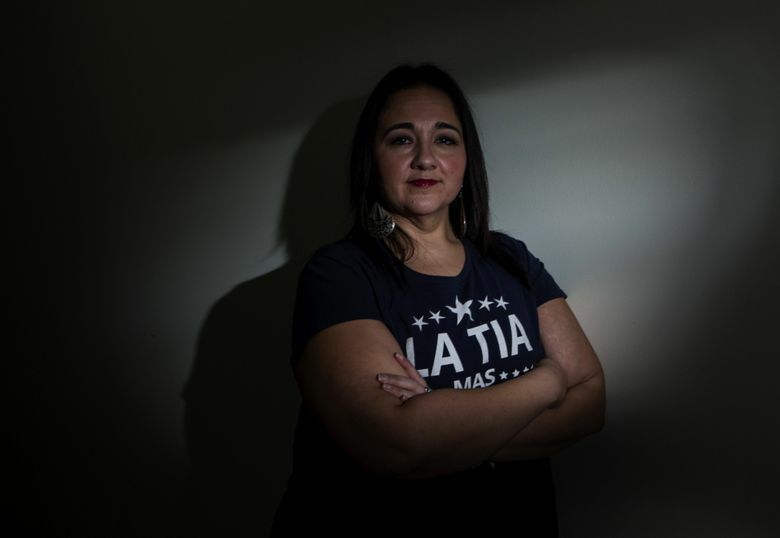 Lopez, 39, draws on both aspects of her background as the paid executive director of the volunteer Seattle Community Police Commission (CPC). Created under a 2012 consent decree between the city and the U.S. Department of Justice to address excessive force and biased policing, the CPC is set to expand in size and scope after winning a yearslong struggle to survive. While the Office of Police Accountability (OPA) investigates individual complaints and a new Office of the Inspector General will watchdog the police, the CPC is supposed to be a voice for ordinary people. That means collecting concerns and pressing the police and lawmakers for changes. Lopez says a challenge is proving the CPC can bridge painful divides as the city tries to cement and improve on its police reforms. “The people living in our communities understand how they’re being impacted by the police. We need to listen to them and work with them,” she said. A lawyer who once planned to devote her career to farmworkers, Lopez entered government after seeing activists speak out against police brutality and racism. The West Seattle resident now mediates among the CPC, Police Department, mayor, City Council and ethnic and religious communities. Though part of her job is administrative — running an office and small staff — the commissioners she answers to also count on her to build strong relationships. Besides minority populations and civil-rights organizations, they represent the Seattle Police Officers’ Guild and Seattle Police Management Association. In January, a federal judge ruled the city in compliance with the consent decree. Sometimes, community members assume the CPC is an arm of the police, rather than an independent group with more clout than other volunteer commissions, Lopez said. Other times, activists like Marissa Johnson express skepticism. In 2015, Johnson helped disrupt a CPC-led forum, disappointed to see police included at a time when Black Lives Matter demonstrations were taking over the streets. That kind of feedback weighs on Lopez. “We hear that we’re pushing too hard, and we hear that we’re moving too slow. We hear from both sides,” she said. Initially a temporary body, the CPC won permanent status and a larger role last spring, when the city adopted legislation bolstering civilian oversight of the police department. Rather than provide input on only certain reforms, the CPC will advise on all policies, practices and services that affect public trust and will confer with the inspector general. Since 2013, the group has issued reports on issues such as biased policing, officer training and public drug use. Police now must use only the force necessary to perform their duties and must report and justify use-of-force incidents, which have decreased. This year, the CPC will study how Seattle could best use investigators from outside the department when officers kill. But the oversight legislation, built on CPC recommendations, may be the group’s top contribution to date, spawning the inspector general and bringing civilian investigators to the OPA. Lobbying took three years, said influential commissioner Lisa Daugaard, director of the Public Defender Association. “Our battle was about ensuring there was a strong community voice and that the work wasn’t turned over to what we call the police-accountability-industrial-complex — an emerging professional class dominated by white men,” Daugaard said. The city has boosted spending on the CPC from $879,000 to $1.41 million this year, allowing Lopez to add staff as the group expands from 15 to 21 commissioners, with the mayor, council and existing commissioners set to appoint seven each. The new resources, Lopez said, should help the still-obscure group increase outreach. “I don’t know what exactly they do,” said Dominique Davis, whose Community Passageways program supports teenagers affected by the criminal-justice system. Police reform is intensely political, said Lopez, who was working at the Seattle University School of Law when then-Mayor Ed Murray hired her for the CPC in 2014. As City Attorney Pete Holmes sought re-election last year. Daugaard and another commissioner, the Rev. Harriett Walden, personally supported his challenger. Around the same time, Holmes warned the council against making the CPC “larger, less focused and much more expensive,” and retired King County Superior Court Judge Terrence Carroll made similar arguments, calling the new setup unwieldy. Johnson says the CPC still lacks relevance because it wields no control over individual disciplinary cases, while Black Lives Matter Seattle-King County organizers say the group’s expansion is a positive step and should allow for youth representatives. “They are the people who come into contact with law enforcement at a disproportionate rate,” the organization’s board of directors said. Councilmember M. Lorena González, who championed the legislation, said the CPC deserves a higher profile. The group’s budget bump includes a raise for Lopez — from $114,000 to $170,000 — meant to put her on par with the Office of Police Accountability director and inspector general. “Our goal has been to create an accountability system with three equal entities,” said González, who has known Lopez since high school in Grandview. Lopez is the kind of aunt who wears a shirt that declares in Spanish “The Most Badass Aunt” to work and brings her 10-year-old niece to City Hall to see women of color in government. A very different experience back home is what drove her to become a lawyer, Lopez said, recalling her stepfather being pelted with abuse by a boss. Such treatment was common, but on a day Lopez’s brother was present, her stepfather quit. “He didn’t want his son to see him treated that way,” she said, eyes watery. Lopez initially planned to use her law degree to help farmworkers. Their obstacles seemed greater than what she saw in liberal Seattle. In Eastern Washington, reporting police misconduct can require walking into a station house, and for many farmworkers, “That’s never going to happen,” Lopez said. Then video emerged of a Seattle officer saying he would beat the “Mexican piss” out of a detained Latino man. A leader at the Latina/o Bar Association of Washington at the time, Lopez joined others requesting a Justice Department review. Lopez, now board president of the immigrant-advocacy group OneAmerica, struck a similar tone during a CPC meeting in 2016, responding to police shootings across the country. “We cannot ‘fix’ the police without a revolution of values,” she said, quoting an essay by civil-rights writer Michelle Alexander. Balancing advocacy and collaboration can be tricky for someone in Lopez’s position, said Tim Burgess, a former City Council member. Yet it was Lopez who played peacemaker last year as the council prepared to vote on the police legislation, González said.